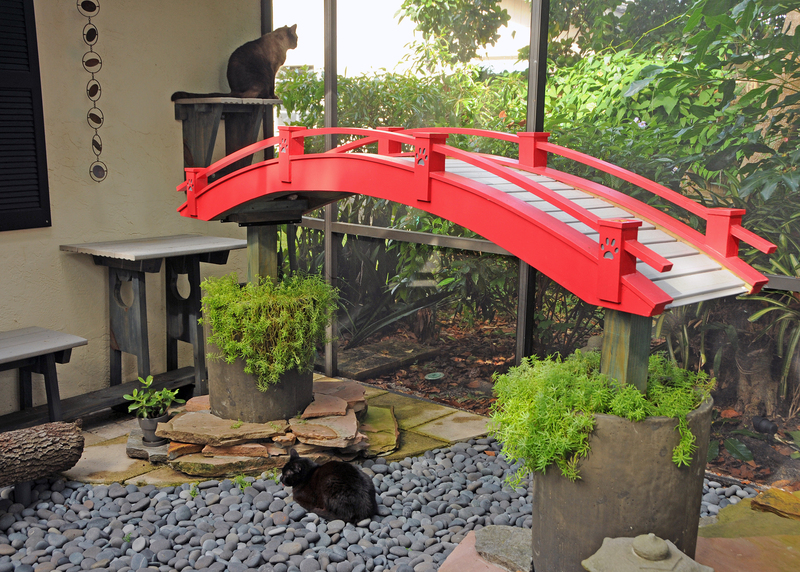 Architect and furniture designer Mario Arbore, the creative force behind Square Paws handcrafted cat furniture, created this incredible Japanese-inspired catio in Melbourne, Florida for some very lucky cats and their humans, Michele and Tim. The project resulted in a complete transformation of an existing enclosure into this breathtaking cat paradise. Read on for all the details. Michele and Tim’s lanai (a screened-in patio, commonly built in Florida) sustained some damage during hurricane Irma in 2017, so they turned to Mario for help creating a space that they could enjoy with their two gorgeous black cats, André and Gaston. (Two additional cats have since been added to the family.) The lanai needed quite a bit of attention before it could become a catio, including repairing damaged screens, removing an existing concrete slab, and adding new pavers. Michele and Tim have a beautiful koi pond on the opposite side of the house from the lanai, so Mario was inspired to continue the Asian theme into the catio. He created a design that includes elements from a traditional Japanese garden: a river, a bridge, benches and a Japanese tea house-inspired structure. The freestanding bridge sits atop two columns that are mounted in large ceramic planters. A “river” of rock flows under the bridge, creating a contrasting texture with the stone pavers and stacked flagstones, all textures that cats love to rub on. 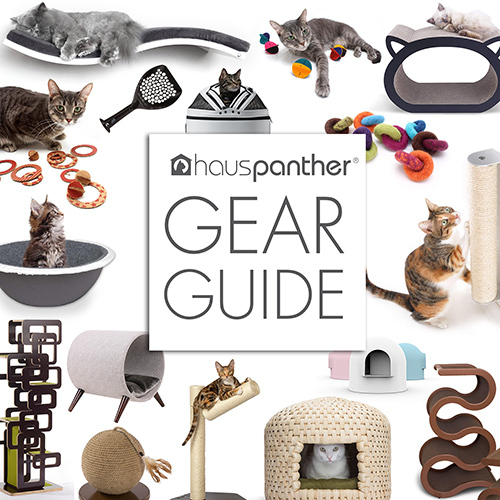 Various perches and walkways around the space give the cats plenty of levels to climb on. Mario used Trex composite decking material for the tops of the perches in order to withstand the elements, plus the texture and color are perfect for this aesthetic. A very special custom piece is mounted to the side of the house inside the catio. This is the Kanji symbol for “sky” or “heaven”, so appropriate for a cat climber! Gaston, shown here enjoying the climber, has a neurological jaw issue that leaves his tongue hanging out. He appreciates being able to get up and away from the other cats whenever he pleases. I’m most fascinated with the little details of this project, from the paw prints on the bridge and tea house to the cat head cutouts in the sides of the wood benches. Mario even included an old log that the cats had been scratching on, mounting it across the river, adding a lovely and functional natural element. Everything about this project warms my heart! Read more about this fantastic project and watch behind-the-scenes videos on the Square Paws website. Mario’s vision and final design far surpassed our initial concept — he created a healthy environment for our cats and a place of beauty and serenity for us. We are very grateful for Mario’s understanding of what cats need for exercise and entertainment. We are very fortunate! Thank you to Michele, Tim and Mario for sharing this amazing catio! Cats Go Crazy for Patti Haskins’ Valentine Catnip Snakes! What a beautiful and serene catspace for three gorgeous house panfurs! Thank you for sharing this with us, Kate. Just stunning. I wish every cat had such loving pet parents and could live in such a Heavenly place. I have comfy benches in front of windows with bird feeders right outside, and make homemade food for my two kitties, but this catio…. might be impossible to beat as far as safety, fun, and beauty. What a lovely catio and what lovely cats! You did a beautiful job! Wonderful fur baby parents! Unique and serene outdoor space for such beautiful kitties. Thanks so much for sharing this. What a delightful space for all!